The race for the T2 Gaia Memories is on! As Kamen Rider Eternal and NEVER descend on Fuuto, Kamen Rider W will be temporarily out of commission! With Phillip captured, can Shotaro save the day on his own? With a little help from the Boss, this hardboiled hero will take on a new role, as Kamen Rider Joker! S.H. 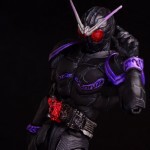 Figuarts Shinkocchou Seihou Kamen Rider Joker is yet another lavish do-over from Bandai. Chipping away at the forms and variations of Kamen Rider W in their premium renewal line, Joker was released as a Tamashii Nations event exclusive last year. It was also made available in mid-2018 via the Tamashii Web Shop. While it’s undoubtedly an easy repaint, and definitely has a dearth of accessories, it’s certainly a form that brings it’s style A-game. While we’ve attached the full 55+ image gallery to this post, you can also read up on our full review Kamen Rider Joker. Just click “Discuss on the TokuNation Forums” at the bottom of this post to be taken to the full thread. Next time, we FINALLY tackle the big SDCC Exclusive of this year with the SOC Black Megazord! We’ve all been expecting some kind of easy repaint for the Tamashii Nations 2017 event this year. Past entries included Dark Kabuto, Baron Lemon Energy and Ryuki Blank Form to name a few. Thanks to a video recorded by twitter user @ta_nobiol we have confirmation of this year’s exclusive! This year’s Tamashii Nations 2017 show exclusive will be S.H. 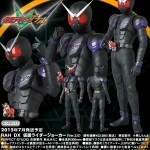 Figuarts Shinkocchou Seihou Kamen Rider Joker! While we have no way of knowing what accessories this figure will come with, the video does confirm that his retail price will be 6000 yen. Tamashii Nations 2017 will be held from December 1st-3rd! 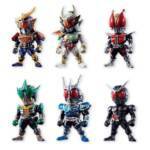 In case you missed it, Bandai announced the next wave of Kamen Rider Converge figurines: Kamen Rider Converge 6. Since then, Bandai’s released coloured images of the set online. 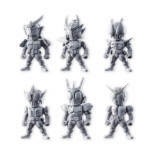 The latest of Bandai’s Kamen Rider Converge series has been announced, with grey prototype photos of Kamen Rider Converge 6 having just been released online. And finally, a seventh mystery figure. 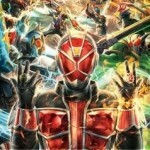 “Heisei VS Showa” Kamen Rider Movie War Full Trailer Online! The first full-length trailer for the upcoming “Kamen Rider: Hesei VS Showa Featuring Super Sentai” Movie War is now online! This trailer features a number of interesting combat encounters and our first look at the fighting style of move-exclusive Kamen Rider Fifteen! 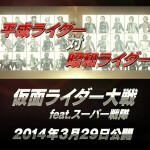 “Hesei VS Showa” premieres in theaters March 29! Until then, be sure to join in our ongoing Discussion Thread and share your thoughts and fears for this exiting project! 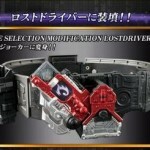 Pre orders for both the Complete Selection Lost Driver and Fang Memory have begun. In an update from Bandai, they’ve revealed that pre ordering both of these items will allow you to receive a bonus T2 Joker Memory, the memory Hidari Shotaro used to transform into Kamen Rider Joker. Both Complete Selection items are due out in December. Fang Memory will retail for 6300 yen while Lost Driver will cost 9480 yen. As these are exclusive to the Premium Online store, a middleman will be needed to buy these. Toy Reviewer zgmf2 brings us our look inside the Web Exclusive S.I.C Kamen Rider Joker figure, from Kamen Rider W.
This stand alone form of W’s Joker half made it’s first appearance in the Kamen Rider W Forever A To Z the Gaia Memories of Fate movie, and the final episode of the series. It appeared again later in the OOOs and Fourze Megamax film. The figure includes two effect parts to replicate his Rider Punch and Rider Kick Maximum Drive attacks, and a set of hands for various different display options. 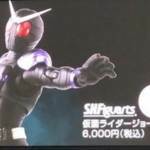 › Companies: Tamashii Nations, Bandai of Japan › Characters: Kamen Rider W, Kamen Rider Joker › Toyline: S.I.C.